Blue Raster and the World Bank Institute teamed up to create Georesults, an online mapping tool that allows users to learn about World Bank projects from an on-the-ground perspective via images, videos, and stories. With this innovative tool, World Bank staff are able to document, contextualize, and share development solutions via interactive multimedia, an accessible alternative to conventional project reports that are often long and technical. Georesults is an extension of the World Bank’s Mapping for Results initiative, founded in 2010, which aims to better monitor the impact of and offer local perspectives on Bank-financed aid projects at the sub-national level. Georesults’ interactive depictions of progress in local communities will help the World Bank track the effectiveness of its work and promote transparency and accountability. 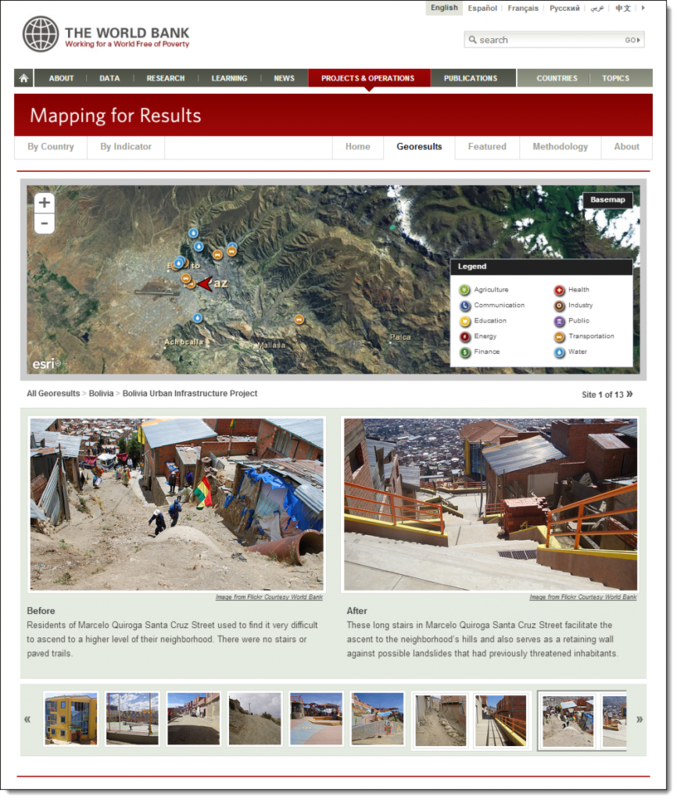 Storytelling alternatives within the Georesults system include sequences of text and photos to illustrate events; before-and-after images that reveal results; and video clips offering an intimate peek into on-the-ground action. Users can browse project sites by location on a world map or search by project ID. The World Bank has taken this app offline.